The London based artists collective Public Works worked with Bourn map-makers, ramblers, land-owners and local primary school during a year-long residency from, 2006-2007, and explored creative ways of talking about the local area. The residency culminated in the exhibition - Cross Country: An Exploration into Rural Public Space 20 March - 27 April 2008. For three days before the exhibition launch a temporary structure was sited at Riddy Lane, Bourn, from where guided walks, talks and rambles took place, followed by map making workshops led by artists at the structure itself and back at Wysing's new Reception building. The temporary structure then travelled to Wysing to occupy the gallery space, joining other works by artists N55, Jose Arnaud-Bello - who had both worked with people of Traveller origin in the area. 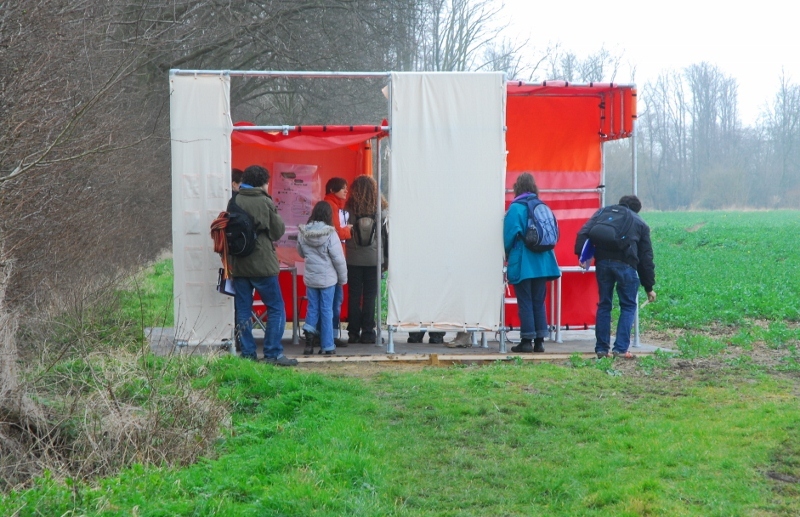 Wapke Feenstra and the Bibliobox - a travelling archive of rural art practice featured in the gallery exhibition - the culmination of the past year's residencies. Public Works is an art/architecture collective consisting of architects Torange Khonsari, Andreas Lang and artist Kathrin Bohm, who have been collaborating in different constellations since 1998.